OppoSuits is a Dutch clothing company that produces stylish suits with striking prints since 2012. The suits, which are available for men, women, boys and teen boys, are appropriate for all kinds of occasions: Christmas, Halloween, national Holidays and parties are a few examples. The suits represent those who don’t take themselves too seriously, but still want to maintain a sense of style. Follow OppoSuits to get news updates on your homepage. OppoSuits is being followed by 0 people. 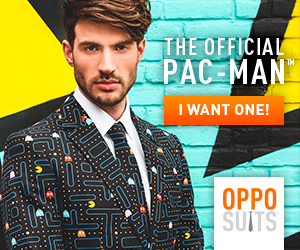 OppoSuits is currently ranked 774 in the directory. Last month its rank was 1591. A Special Offer was added for OppoSuits: OppoSuits Free Next Day Delivery! 36 days ago. A Special Offer was added for OppoSuits: Oppo Suits, Buy 5 Items and Get a 5% Discount! 36 days ago. A Special Offer was added for OppoSuits: Oppo Suits, Buy 10 Items and Get a 10% Discount! 36 days ago. A Special Offer was added for OppoSuits: OppoSuits Free Next Day Delivery 52 days ago. A Special Offer was added for OppoSuits: Oppo Suits 52 days ago. A Special Offer was added for OppoSuits: OppoSuits Free Next Day Delivery 56 days ago. A Special Offer was added for OppoSuits: Oppo Suits 56 days ago. A Special Offer was added for OppoSuits: OppoSuits Free Next Day Delivery 69 days ago. A Special Offer was added for OppoSuits: Oppo Suits 69 days ago. A Special Offer was added for OppoSuits: OppoSuits Free Next Day Delivery 72 days ago.